Thyroid, Parathyroid, Adrenal, Endocrine Surgery, Prior to parathyroid surgery what tests must be performed? 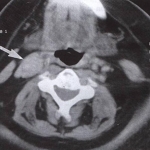 Parathyroid tumours vary in their position in the neck. For many years the adage was that the only localisation necessary was the name of an experienced parathyroid surgeon! The problem has always been that in most cases parathyroid surgery is straightforward, with only 20% of cases representing a difficult problem. However, modern imaging has now progressed so much that it is churlish not to consider its use in both first and second operations.It was suprising therefore to read a recent report in 2007 from the Tertiary Parathyroid Centre in The Aintree University Hospital Liverpool UK citing their practice. The Aintree University Hospital Radiology and Surgical Audit meeting presentedan impressive number of patients undergoing parathyroidectomy (75 in 2 years). Only 69% of patients had an ultrasound while only 52% had nuclear medicine scans,57% failed tohave both.This resulted in 75% of patients beingdenied a targeted approach with a small incision and its associated low complication rate.Itmust be emphasied to patients that if they are not offered a scans and the possibilty ofatargeted approach is not discussed to ask your general practictioner for a second opinion. Large incisions for parathyroidectomy are only necessary in 15% of cases and are becoming less and less necessary.In fairness to the Liverpool Group they state"there is scope for more patients with primary hyperparathyroidism to safely undergo targeted parathyroid operations than is done at present at our centre". The situation at Aintree has been remedied by the appointment of Mr Robert Hardy in 2008 as Endocrine Surgeon to the hospital. Mr Hardy has had extensive training in parathyroid surgery and insists that all patients undergoing parathyroid surgery have both a sestamibi scan and a neck ultrasound. Mr Hardy's approach will allow ahigh number of patients to be treated by targetedsurgery. Longitudinal US scan of right neck with an intrathyroidal parathyroid adenoma, 7.5 MHz probe. Using high frequency probes both single adenoma and multiple parathyroid enlargements may be located. Normal parathyroids are not usually seen and there is a 25% failure rate to detect significant parathyroid pathology. False positive results are due to thyroid nodules and lymph nodes, but the most common cause is operator inexperience. Rarely parathyroid tumours lie totally within the substance of the thyroid and pre-operative ultrasound may demonstrate such tumours very clearly.The weight of the parathyroid tumour is the most important factor in its visualation. The Mayo Clinic have shown that tumoursof 1000 mgs or more are visualized in over 95% of cases.Tumours weighing less thhan 200 mgs are visualizedin less than 5% of cases.Large parathyroid tumours may be missed by ultrasound because they are behind the oesophagus. 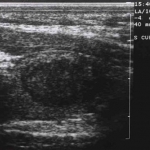 Some centres combine ultrasound with fine needle aspirationof the presumed parathyroid. We do not recomnend this because it is easy even with the finest needle to break the capsule of the parathyroid and spill parathyroid cells which will seed in the local soft tissues and make long term cure difficult or even impossible. 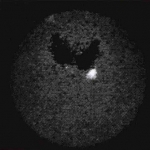 Sestamibi subtraction scan demonstrating a left inferior parathyroid adenoma. Sestamibi scans will demonstrate pathology in over 80% of cases. Sestamibi is a small protein attached to technetium 99, a mildly radioactive compound (the radioactivity poses no danger to the patient). It is injected into the patient, travels round the body and is then taken up by the parathyroids more readily than the thyroids. 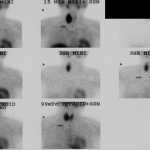 A scan is then performed by a detector that picks up the radioactivity, allowing good localisation of the parathyroid glands.Some cellular factors influence the uptakeof parathyroid tumours by Tc-Mibi. The most important factor influencing uptakeis the weight of the parathyroid tumour. Biertho and co-workers have classified TC-Mibi uptake from 0(false negative) to 3 (high uptake) and typeI (equivocal uptake).The 0-type tumours have a median weight 250 mgs and account for of 8% of tumours. The type I uptake had a median weight oF 340 mgs and accounts for 26% of tumours. This information is very helpful to the surgeon since it suggests in negative or equivoal scans the weight of the tumour will most likely be less than 500mgs.The scans are less helpful in cases of 4 or more gland disease (parathyroid hyperplasia), and cannot be used in pregnancy. CT scan of an ectopic parathyroid adenoma at the carotid bifurcation. These two imaging techniques can be discussed together. Both are particularly useful when previous surgery has failed and reinvestigation is required, butare not indicated before first operations. Normal parathyroids are not usually seen by either imaging method. Parathyroid adenomas are more consistently detected than parathyroid hyperplasia.A recent developement is the use of SPECT-CT to image parathyroid tumours.Arecent study in 2009 fromthe Leeds TeachingHospital evaluated the role of SPECT-CTfor finding parathyroid tumours. This studyshowed that SPECT-CT demonstrated the presence and location of a parathroid adenoma in 91% of patients. The Leed's group suggest that if a tumour is found on SPECT -CT that ultrasound examinatiom of the patient is unecessary.MRI may be used in pregnancy and is the imaging of choice combined with ultrasound in the pregnant patient. These invasive tests entail the passage of catheters from the groin into the arteries and veins of the neck. A map of the blood supply to the neck is made and the abnormal parathyroid tissue identified. This invasive technique is more than 95% accurate even in difficult cases where previous surgery has failed. 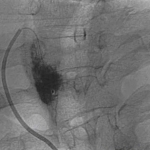 Arteriography should be combined with neck venous blood sampling (locating the veins with the highest parathyroid hormone level) and is mandatory before any parathyroid neck re-exploration. It is very important to have a venous map of the neck because very often particularly in patients whohave had previous surgery a tumour on one side of the neck may drain by a rogue vein into the other side of theneck. If one is not awareof this the wrong side of the neckcould be explored.In sick patients unfit for surgery arteriography can be used to destroy the parathyroid tumour. It cannot be stressed too strongly that even though all the pre-operative tests are negative, as long as the blood tests confirm hyperparathyroidism there is still an excellent chance that an experienced parathyroid surgeon will cure the patient. Expert parathyroid surgeons would expect a success rate of 98%. It must be remembered that even in the best hands there is still risk of failure.